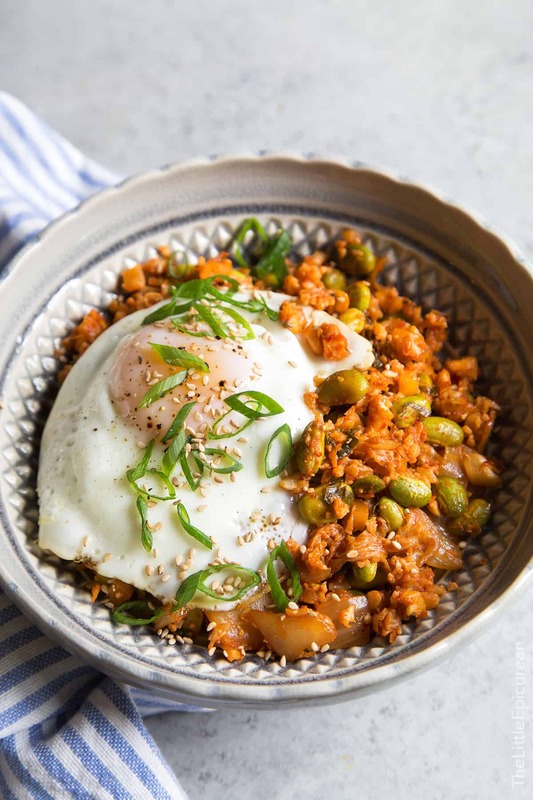 Baked kimchi cauliflower rice: this healthier version of “fried rice” transforms roasted cauliflower into a savory and hearty meal. For months, my best friend tried to convince me to eat cauliflower rice. I firmly refused several times. I like white rice, thank you very much. Eventually I wore down. My curiosity for this healthy rice alternative grew after seeing other customers load bags and bags of it at Trader Joe’s and Costco. While I love roasted cauliflower, the notion of swapping my beloved white rice for a vegetable seemed ridiculous. I finally caved and gave it a try. To my surprise, I’ve been hooked on cauliflower rice ever since. 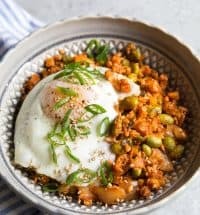 This cauliflower “fried rice” is a variation of the baked kimchi fried rice recipe I shared two years ago. Out of all the ways I’ve experimented with cauliflower rice thus far, THIS IS MY FAVORITE. 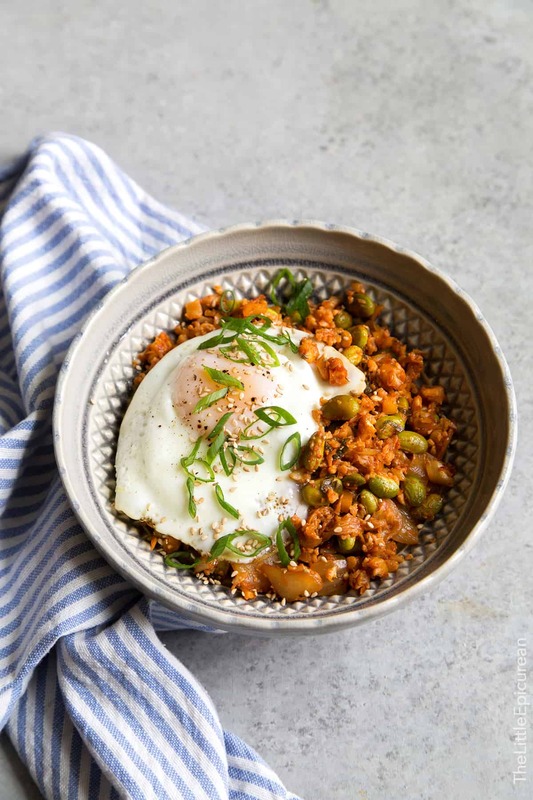 With the exception of the cauliflower rice, all the ingredients are the same as the baked fried rice version. The recipe calls for one pound of cauliflower. It may seem like a lot, but it will shrink. The cauliflower will greatly reduce in size as it cooks. And as it shrinks, it’s flavors will become more intense. I reduced the amount of kimchi from the original rice recipe by 1/2 cup. Even if you LOVE kimchi (like me), the reduction is needed as to not completely overpower the cauliflower. I like to put an egg on everything! The top photo is how I like to eat kimchi cauliflower rice. Alex does not share the same fondness for eggs. I made him the version below. 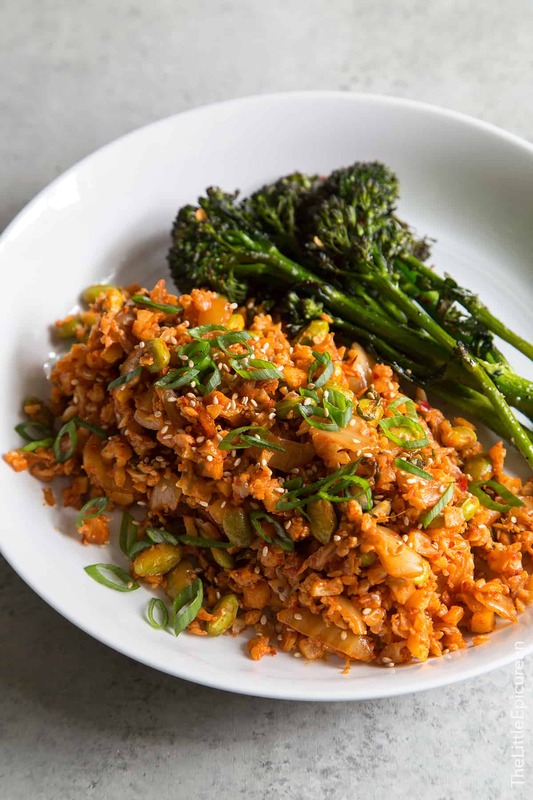 He enjoys his kimchi cauliflower rice with a side of roasted broccolini. This intensely flavored dish sounds too good to be true. 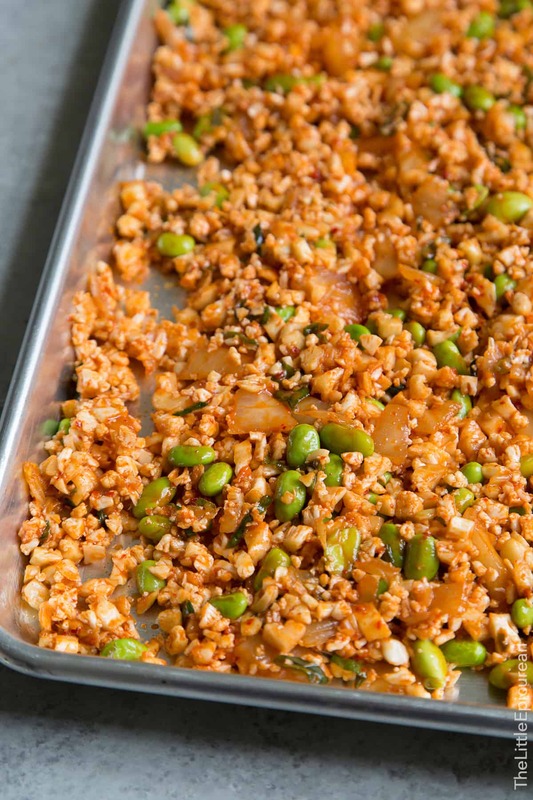 It’s super filling and it doesn’t taste “healthy.” This kimchi cauliflower rice can be served as a side or enjoyed as a meal in itself. It has become a staple in our dinner rotation! 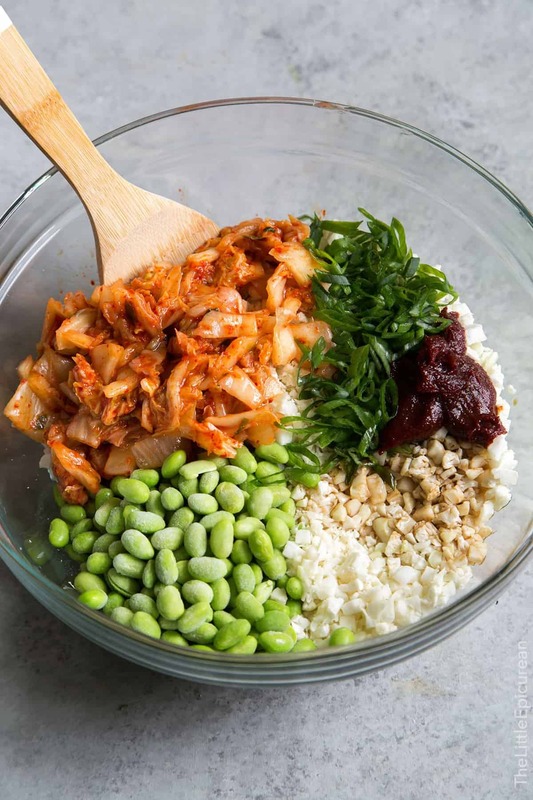 In a large bowl, combine cauliflower rice, kimchi, kimchi juice, gochujang, soy sauce, sesame oil, rice bran oil (or vegetable oil), frozen edamame, and sliced green onions. Fold to combine until ingredients are thoroughly mixed. Spread mixture on a large baking sheet (13 x 18-inch). The baking sheet will be very full. Use two smaller baking sheets, if necessary. Bake for 30-35 minutes. Every 10 minutes remove baking sheet from oven, stir mixture, and spread out again. As the cauliflower cooks, it will greatly reduce in size. Serve warm and garnish with green onions, sesame seeds, and fried egg. You can make your own "cauliflower rice" by pulsing cauliflower florets in the food processor. Kimchi juice refers to the liquid the cabbage expels as it's fermenting/pickling in the jar. Everything should come with an egg on top! lol, yes. we’re buying bags and bags and bags from Costco! Totally impressed. I try to eat kimchi at least three times a week for the probiotics. Never, ever did it occur to me to pair it with cauliflower. What a nutritious, flavor packed meal! Eggs rule!